The looks of this gluten-free rhubarb upside Down Cake are so beautiful, they need no embellishment. 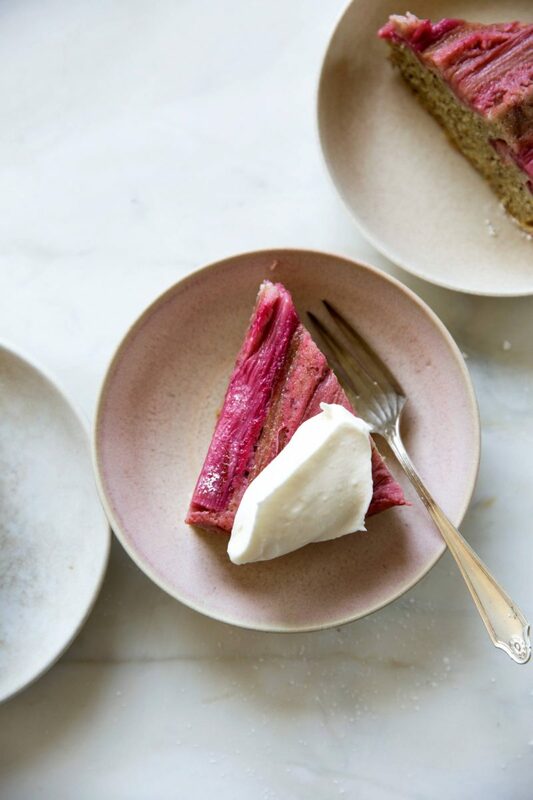 The same is true for the taste—the combo of sour, creamy rhubarb and moist, slightly sweet olive oil cake is nothing short of thrilling. Preheat the oven to 350°F. Cut a circle of parchment paper 8 inches in diameter. Grease an 8-inch cake pan with butter, line the bottom of the cake pan with the parchment circle, and grease it also. Sprinkle the 2 tablespoons sugar on the bottom and sides of the cake pan. In a large bowl, mix together the brown rice flour, almond flour, baking powder, baking soda, salt, and lemon zest. In a medium bowl, whisk together the remaining 3/4 cup sugar, the eggs, vanilla, olive oil, and the reserved rhubarb puree. Pour the wet ingredients over the dry ingredients and whisk to combine. Pour the batter over the rhubarb in the cake pan and spread evenly. Bake until a toothpick inserted into the center comes out clean, 50 to 55 minutes. Cool in the pan for 15 minutes, then invert onto a cooling rack. Transfer to a cake plate, bottom side up, dust with powdered sugar, and serve.